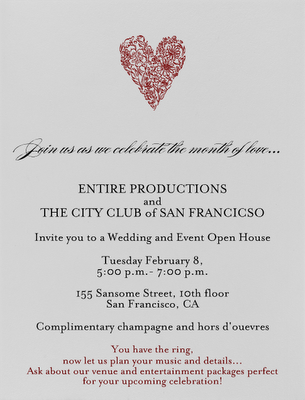 You have the Ring, Now Let's Plan your Music and Details | Entire Productions, Inc.
Join us at the beautiful City Club of San Francisco and indulge in complimentary champagne and hors d'ouevres. We have been a member of this private club for over 2 years and love their old-world style and personality. They're available as a venue for special events, so please come down and check it out!We're offering a special valued package to those who attend. See you there!